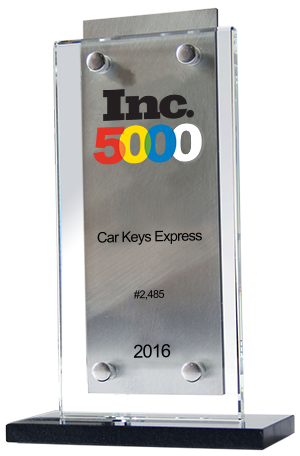 Louisville, KY USA: Car Keys Express makes an inaugural appearance on this year’s prestigious Inc. 5000, debuting as the 9th fastest growing company in Kentucky and ranking at 2,485 in the US. Each year, this list honors the most innovative and fastest-growing companies across the nation. It represents a comprehensive look at the most important segment of the economy, privately owned entrepreneurial businesses. “For 35 years, Inc. has welcomed the fastest-growing private companies in America into a very exclusive club… As an Inc. 5000 honoree, Car Keys Express now shares a pedigree with Intuit, Zappos, Under Armour, Microsoft, GoPro, Timberland, Clif Bar, Patagonia, Oracle, and other notable alumni,” said Eric Schurenberg, President and Editor in Chief, Inc. Media. About the Inc. 5000: Inc. Magazine has served as a premier print publication for business owners and entrepreneurs for over 30 years. In addition to their print presence, in 1996 they launched their website which quickly grew to become a preeminent resource of both information and inspiration for those in the business world. As a trusted resource for business leaders, Inc. rolled out the annual Inc. 500 in 1982 to honor the fastest growing privately owned businesses in the US, then expanded to the Inc. 5000 in 2007, providing an even broader view of the nation’s entrepreneurial landscape. About Car Keys Express: Car Keys Express is a division of iKeyless, the world’s first online retailer of automotive keys and remotes. iKeyless specializes in the design, manufacture, retail and wholesale distribution of automotive keys. The Car Keys Express division provides mobile key replacement services for car dealerships and fleets nationwide The division is America’s fastest-growing dealership vendor and only nationwide discount mobile key vendor. In 2002, the Founder of the company started iKeyless from scratch on his dining room table in his one-bedroom apartment, in Louisville, Kentucky. In 2007, the business moved out of the Founder’s apartment and into its first office. In 2012, 2014, and 2015 iKeyless acquired three buildings in Louisville’s downtown to facilitate the growth of the company. Today, iKeyless is the world's largest company specializing in replacement keys and keyless entry remotes. In 2008 iKeyless purchased a second-hand van and experimented servicing business fleets and car dealerships. Success came slowly, with growth funded exclusively by reinvested profits. The division now known as Car Keys Express, operates nationwide with employees in 42 states. 2009 marked iKeyless’ modest beginnings of its research and development division. In 2011, iKeyless began manufacturing its own replacement automotive keys, while steadily growing a team of world-class engineers. In 2014, iKeyless celebrated the release of its highest product development achievement to date--the world’s first Universal Car Remote. The Universal Car Remote has been received enthusiastically, and is currently sold by retailers across North America. In 2015, iKeyless launched their design and development division, Solid Keys USA. Their inaugural product, the world’s first Universal Car Keys, debuted at the automotive parts industry’s premier tradeshow, winning the highly coveted Best New Product award. About World’s First Universal Car Keys and Remotes: Introduced in the fall of 2015 and awarded “Best New Product” at the 2015 Automotive Aftermarket Product Expo (AAPEX/SEMA) in Las Vegas, the Universal Car Keys and Remotes line is compatible with more than 100 million vehicles on the road today. The line covers makes from Acura to Volvo, manufactured between 1989 and 2016. Priced as low as $24.95, they afford customers a high-quality, low-cost alternative to the rising cost of automotive keys.